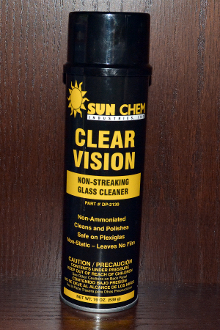 Sun Chem Vision Glass Cleaner is a foaming glass cleaner that cleans and polishes glass without streaking. Combining alcohol, emulsifiers and surfactants, this product gives quick, one step cleaning on all glass and plexiglass surfaces. Contains no ammonia. The non-static formulation keeps surfaces clean longer and will not leave a film. Pleasant fragrance.